Be the first to share your favorite memory, photo or story of Rhoda. This memorial page is dedicated for family, friends and future generations to celebrate the life of their loved one. A Cox’s Creek resident, Mrs. Rhoda Elizabeth Hopper age 96, passed away Tuesday, March 25, 2019 at her residence. Rhoda was born on June 14, 1922 in Nelson County to the late James Asa and Sadie Elizabeth Owens Fulkerson. She was retired from Jim Beam Distillery after 29 years, a homemaker, loved to make quilts and was a member of New Salem Baptist Church. Besides her parents she was preceded in death by her husband James Hopper, a daughter, Shirley Kate Martin, 3 sisters, Mamie Bell Watkins, Emma Mudd, Lillie Mae Raymond, 4 brothers, Woody Fulkerson, J.C. Fulkerson, Asa Lee Fulkerson and Jesse Fulkerson. 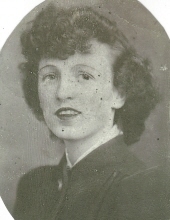 She is survived by a daughter Patsy (Jesse) Johnson of New Haven, a son, James Lee(Shirley)Hopper of Cox’s Creek, 15 grandchildren, 32 great grandchildren, 11 great-great grandchildren, 2 great-great-great grandchildren along with several nieces and nephews. Funeral services for Mrs. Rhoda Hopper will be 2:00pm, Friday, March 29, 2019 at the Houghlin Greenwell Funeral Home with her grandson James Marion “Possum” Hopper officiating. Interment will be in New Salem Baptist Church Cemetery. Visitation will be Thursday from 4:00-8:00pm and after 9:00am Friday at the Houghlin Greenwell Funeral Home, 1475 New Shepherdsville Rd., who is in charge of arrangements. The family request that expressions of sympathy take the form of contributions to Hospice of Nelson County. To send flowers or a remembrance gift to the family of Rhoda Elizabeth Hopper, please visit our Tribute Store. "Email Address" would like to share the life celebration of Rhoda Elizabeth Hopper. Click on the "link" to go to share a favorite memory or leave a condolence message for the family.